Music and musical direction by Allison Tartalia. As a writer of historical plays, I mirror the present by uncovering our past. 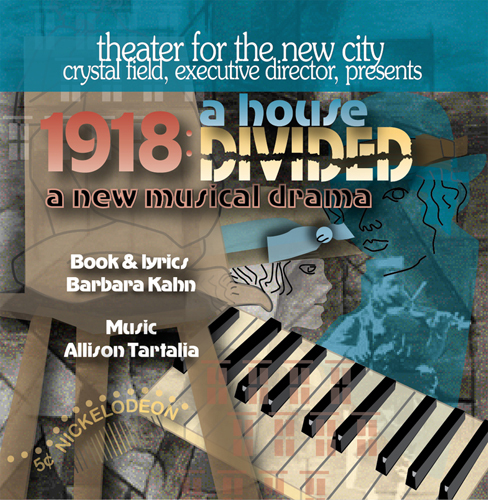 1918: A House Divided is a musical drama about the generational and cultural conflicts in an immigrant family in New York City, set against the larger conflict of World War One, called “The War to End All Wars.” The outstanding issues that faced New Yorkers and all Americans in 1918 bear a striking parallel to what we face nearly a century later. A hotly debated war brought legislation that branded dissenters as unpatriotic, subjecting them to fines and imprisonment, and for non-citizens, deportation. Anti-foreign sentiments inspired legislation curtailing immigration. Homosexuality was forbidden and scorned, yet it drew tourists to the downtown “drag balls” in 1918, just as it draws tourists and tour buses to Greenwich Village today. (We recreate one of those notorious events that were held at Webster Hall in 1918). The conservative mood nationwide was in contrast to the mood among many New Yorkers, particularly those involved in the worlds of music and art and in the nascent lesbian and gay community in Greenwich Village. The cultural richness of New York was reflected in the many musical sounds that could be heard, from jazz to ragtime to ethnic folk music brought here by the immigrants. I am delighted to reach across a generation to work with Allison Tartalia, an award-winning young composer and performer. As a first generation American, I know very well the difficulties of immigrants raised in the traditions of Eastern European in adapting to their new homes in America. Aside from learning a new language (and new alphabet), they were often without the support of their extended family. They watched their American children drift into lifestyles beyond their understanding. 1918: A House Divided recreates the “worlds apart” of an immigrant household in Brooklyn and the gay and lesbian community in bohemian Greenwich Village. It expresses the anguish of displacement, no matter in what century it occurs, and the familial love that overcomes the generational, cultural and sexual divides. I am both proud and fortunate to have my play presented at Theater for the New City (TNC). This is my 14th annual production at Theater for the New City. Now in its 36th season, TNC is a community-oriented fixture on the Lower East Side, under Executive Director Crystal Field. Its tradition of presenting new American plays without regard to race, religion, gender, sexual orientation or age of the authors has earned it a city-wide reputation and audience. I began my professional career as an actor Off-Off Broadway while still a teenager. I learned from the “masters,” including Ellen Stewart of LaMaMa, Tom Eyen (who went on to write Dreamgirls), Ron Link, Robert Dahdah and other legends. Creating roles in original productions at such a young age gave me the opportunity to learn the real joy of collaboration, of pooling talent and expertise and even lunch money. Those mentors paid attention to a young and somewhat fearful actor, giving me the confidence to take risks theatrically. I have tried to apply what I learned from them in my subsequent work as playwright and director. 1918: A House Divided is no exception.